BOSTON - Chael Sonnen submitted Shogun Rua in a first round shocker in the main event of UFC Fight Night 26. Irishman Connor McGregor battled in front of a vibrant Boston crowd at the TD Garden who gave him a huge reception upon his arrival. 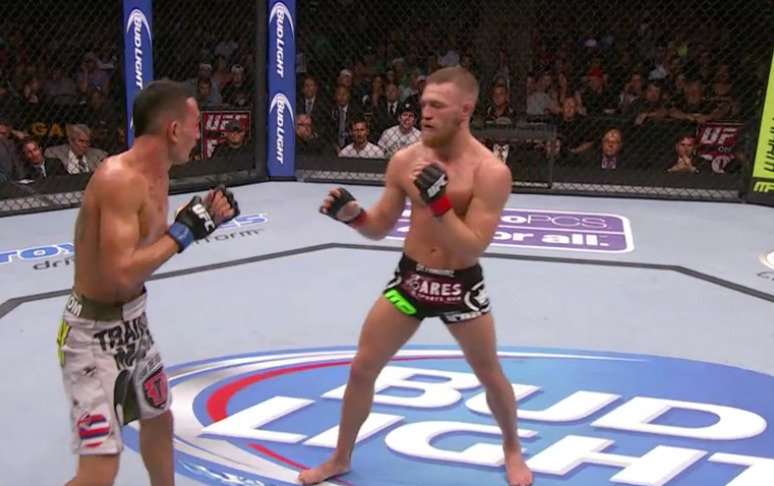 McGregor had a lot of hype surrounding him going into this fight as he battled 21-year-old Max Holloway. Connor McGregor surges forward looking for the finish. Connor McGregor had an excellent first round, demonstrating great kicks and incorporating some great acrobatics into his arsenal. The 21-year-old Max Holloway took some damage as Connor McGregor invited him to take more strikes. There was more of the same in the second round, but this time we saw Connor McGregor's ground game. While Max Holloway may have kept a great guard, it was also a great struggle as McGregor dominated the first two rounds. There was more of the same in the third round with more ground and pound as Connor McGregor dominated the three rounds. A great showcase of unorthodox skills, striking and a dominant performance by Irishman Connor McGregor, who defeated Max Holloway via Unanimous Decision (30-27, 30-27, 30-26). Connor McGregor picks up another win, and now fans are excited for the next time he fights. Two top Bantamweights battled with the young Michael McDonald battling Brad Pickett. McDonald may have beaten Pickett's resolve, but not his chin. 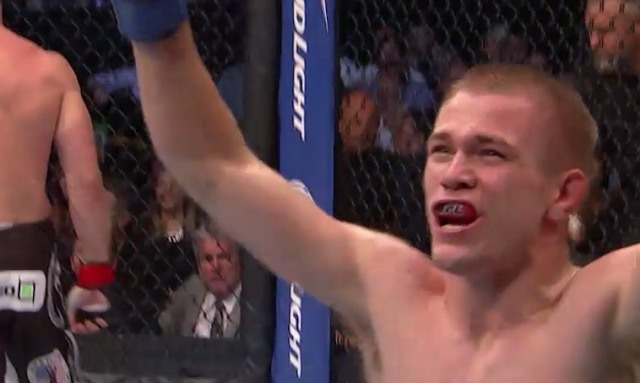 Superb striking in the first round, but that was not good enough to beat Brad Pickett's very durable chin, but it was the submissions that came to his advantage with the Triangle Choke making Pickett tap out and Michael McDonald defeats Brad Pickett via Submission (triangle choke). UFC Fight Night 26 kicked off with some great action in the prelims. We witnessed a war between Brandao and Pineda, a great showcase of unorthodox offense from the Irish Connor McGregor and another superb victory for Michael McDonald. It set up for a fantastic main card. The bonus-winning Joe Lauzon stepped back into the Octagon to battle Michael Johnson in the firsr fight of the main card. 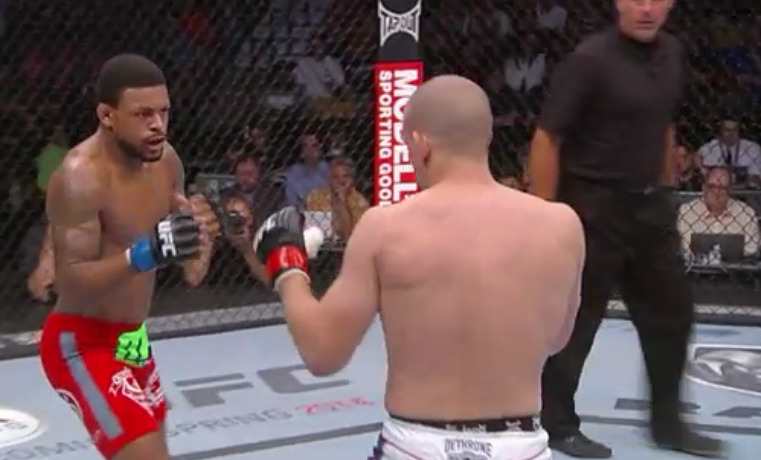 Michael Johnson's speed gave him a huge edge in the first round, and his striking had Joe Lauzon in dire straits. Lauzon took some hard hits, but his endurance allowed him to continue strong in front of his home crowd. Johnson slowed down in Round 2, allowing Lauzon to contend with him much better than in the previous round. The second Round went at a much slower pace with less significant moments though Lauzon seemed to stay in it with better success in Round 2 as oppose to Round 1. A takedown just before the end of the round could have been of great significance on the scoring cards. "I need you to work like you've never worked before"
Joe Lauzon was exhausted after taking a lot of punishment in Round 1. Joe Lauzon just seemed too exhausted to put out any take downs or any huge strikes, the damage acquired from Round 1 took it's toll. However, he remained resilient, and managed to get to the end, but not get the win. Michael Johnson looking on top form as he defeats Joe Lauzon via Unanimous Decision (30-27, 30-27, 30-25) in an incredible performance. It was a battle of prime knockout artists as TUF 17 runner-up Uriah Hall took to the Octagon to battle Boston's own John Howard. Uriah Hall was quick and stealthy in the first round, going for an early takedown before allowing Howard to get up for stand-up striking. Twice in the first round, Uriah Hall went for the spinning kick, reminiscent to his TUF 17 knockout, but Howard was able to move out the way. John Howard pressurized Uriah against the cage, including a Guillotine attempt. It was a much slower round as Howard managed to contain Hall. Going into Round 3 it seemed like a very close fight. But the third round was again slow and quite lackluster, and the final 20 seconds were the most entertaining, with Uriah Hall diving as he went for a kick, and Howard came close to nailing him and if that hit, it would have been lights out. It goes to the judges and John Howard wins via Unanimous Decision. A fight that had too much mutual respect, it is the UFC and after all it is a fighting business. Hall may now be subject to some criticism for the performance, but the biggest underdog on the card John Howard defeats Uriah Hall via Split Decision. Welterweights Matt Brown and Mike Pyle, and there win streaks collided, with one streak coming to an end in a bout that would make or break contendership. Matt Brown ended it quickly with a huge knee before finishing the bout via TKO. Brown's winning streak continues as he defeats Mike Pyle via TKO in Round 1. 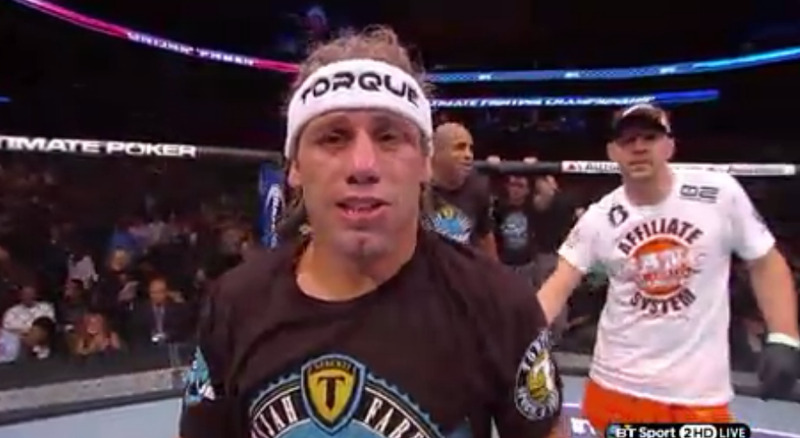 Bantamweights Urijah Faber and Iuri Alacantra engaged in a great ground war when they fought in the main card. The first round witnessed a great ground battle and showcase of superb wrestling by both combatants, this continued throughout the other rounds in a grueling bout, and Faber scored over 130 ground strikes. Fatigue built in after Faber grinded out on the ground. Faber rises to the occasion with nasty ground and pound dominating Alcantara. Faber wins by unanimous decision. Urijah Faber after his win. After an enthralling strike war between the two giants, Overreem looked like he was closing in on the victory to finish Travis Browne, but he approached Browne with no respect and walked straight into a face kick and he was out. Once again, Overreem does not respect the striking, and he pays for it. Chael Sonnen was quick to defeat Shogun Rua and cut straight to the action by taking down Rua. Rua struck back with his own takedown attempts and after a wrestling scrap Chael Sonnen had locked in the Guillotine tight on Rua and he tapped out. Faber vs. Alcantara - The Bantamweights take the best fight on the main card, a great ground war between Faber and Alcantara proved for great entertainment. Brad Pickett - Although the Bantamweight would tap out from a Traingle Choke in the second round from Michael McDonald, he did not go down in the vicious flurry of punches in Round 1. Michael McDonald even acknowledged this, how he hit him so hard and so many times yet he was not finished. Props to Brad Pickett for the incredible resilience there. Joe Lauzon - Although he fought through it, Boston's Joe Lauzon fell short against Michael Johnson, of who looked on top form. Shogun taps - Shogun tapping was the last outcome I would have expected from the fight, Chael Sonnen applies a strong Guillotine to submit the former Light Heavyweight Champion. Shogun, Uriah Hall, Overreem - Overreem has not learned from his mistakes, if you don't show respect to your opponent, you will get knocked out.. Meanwhile Uriah Hall had a lackluster performance and Shogun tapping out was something I did not expect at all. Chael Sonnen makes a huge statement and shows that he is still the fighter that we first saw, he has submitted Shogun Rua. Plus, Alistair Overreem has suffered another loss, and Faber prevailed against Alcantara in a great ground war. UFC has kicked off from it's new home on FOX SPORTS 1.